Organised | Cancer Research Project - Ayurved Hospital and Research Center - Bharatiya Sanskriti Darshan Trust . :Ayurveda for Cancer:. 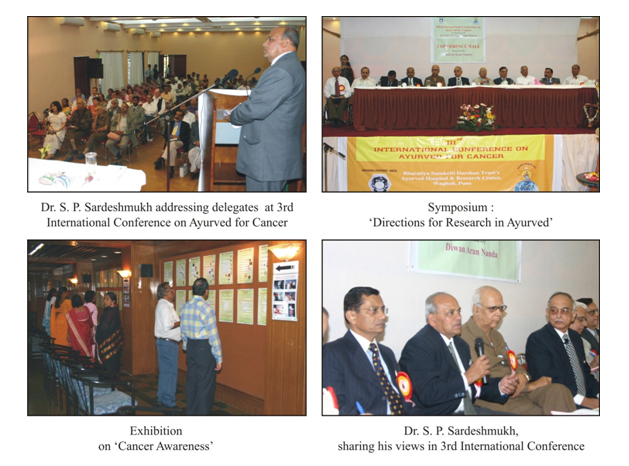 Fourth International Conference on “Ayurved For Cancer” was held at Hotel ISTA, Pune on 3rd – 4th November 2012 under the able guidance of Prof. Dr. S. P. Sardeshmukh. The Cancer Conference was special in its strong emphasis on Cancer – Pathogenesis, Diagnosis, Therapeutics and especially the case reports which is the evidence of the extensive research work going at all the centers of Integrated Cancer Treatment and Research Centre (ICTRC). This conference was a common platform for presenting and sharing Research on Cancer in various medical fields all over the world. Also, patients from India and across the world taking Ayurvedic treatment in our Cancer Research Centre attended the conference. The inauguration of the Conference was done by the auspicious hands of distinguished Nuclear Scientist, Chairman of Atomic Energy Commission, Secretary Government of India, Department of Atomic Energy and Ex-Director of BARC, Honorable Padmavibhushan Dr. Anil Kakodkar. In his inaugural speech, he emphasized on the grievance of Cancer and the need to work more on Cancer control programs. Mr. Diwan Arun Nanda also graced the occasion as Guest of Honor. He expressed faith in Ayurved towards treating Cancer patients. During the inaugural ceremony, a short documentary was shown focusing the various undertakings of Integrated Cancer Treatment and Research Centre. 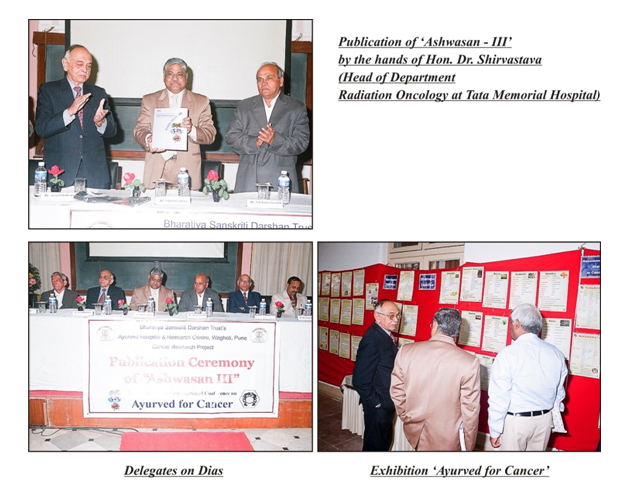 Charts and Posters of ‘Cancer Research’ of ICTRC were exhibited on this occasion and its inauguration was done by the auspicious hands of Dr. A. V.Chainulu, renowned Research Scientist and Mr. DiwanArun Nanda. Dr. P B Desai, Ex- Director of Tata Hospital in his oration lecture highlighted on Cancer prevention being the best cure. Dr. V N Shrikande, Eminent Onco-surgeon of Biliary-Pancreatic system delivered Guest lecture in which he mainly conversed about the Gastro Intestinal Surgeries performed by him in Cancer patients with the help of case reports. Further he said, Cancer is not one disease, but caused due to multiple factors and so the counteract on this disease must be multi pronged. Cancer is holistic so our response should be with collaboration of multiple Pathies. There were in all seven Scientific Sessions on the topics like Pathogenesis and Diagnosis of Cancer, Cancer therapeutics -1, 2, 3;Alternative Therapies, Case Reports. Researchers & Clinicians working in the field of Cancer&Ayurved, Allopathy & other medical systems namely Dr. ArvindKulkarni, Director, Oncology, ICTRC; Dr.S.K.Shrivastav, HOD of Radiation Department of Tata Hospital; Dr.Jayprakash Narayan, Ex-Vice President of CCIM; Dr.Ashok Vaidya, Research Director at Medical Research Centre, Kasturba Health Society and Expert in Reverse Pharmacology; Dr.S.K.Mishraj, Ex- Advisor AYUSH, Department of Ayurved, Govt. of India;PadmashriDr.Suresh Chaturvedi, Leading Ayurvedic Practitioner;Padmashri Dr.BalenduPrakash, Founder Director of Vaidya Chandra Prakash Cancer Research Foundation, Dehradun;Dr.Horst Poehllmann from Australia, Dr.GoeffreyMorell from Americagraced the conference. The Conference concluded with Valedictory function. PadmashriDrDarshan Shankar and MrRanjitPuranik were Guest of Honor. DrDarshan Shankar in his speech praised the activities taken up by BhartiyaSanskritiDarshan Trust and emphasized that we need dozens of such trusts which gives us the traditional glimpse of India. An inspiring narration was done by MrRanjitPuranik. He briefed that conduction of such international conferences are national services. On this occasion, Honorable Padmavibhushan Dr. Anil Kakodkar visited ICTRC, Wagholi & interacted with Staff of Radiotherapy Department & Cancer patients. A Reorientation training programme for Research Fellows was held at Integrated Cancer Treatment And Research Centre on 30/4/2012 and 1/5/2012 under able guidance of Prof. Dr. S. P. Sardeshmukh. A Legendary Personality in the field of Ayurveda Prof. Dr. R. H. Singh guided the research fellows at Integrated Cancer Treatment and Research Centre. Dr. Vineeta Deshmukh started the 1st session by presentation on “Ayurvedic Approach of Cancer. 2nd Presentation was delivered by Dr. Anjali Deshpande on “Panchakarma Treatment in Cancer”. Dr. Janhvi Pingle explained the co-relation of Ca Breast by Ayurvedic and modern view. Dr. Abhijit Saraf discussed the role of “Shasti Upakarma in management of Cancer” with the Dr. R.H. Singh. A Presentation on CA tounge was given by Dr. Shreenivas Datar. Concluding lecture was presented by Dr. Vasanti Godse on “Dietetics in Cancer” Dr. Ranjit Nimbalkar presented various Research Protocols designed in Integrated Cancer Treatment and Research Centre, Wagholi, Pune. Prof. Dr. R.H. Singh guided all research fellows by giving his valuable suggestions on each presentations. On the 2nd day (1st of May) Prof. Dr. R.H. Singh visited Atharva Ayurved Pharmaceuticals. He visited each section and Dr. Sukumar Sardeshmukh gave him details information about the Pharmacy. In this visit, Prof. Dr. R.H. Singh Sir also discussed the topics like drug standardization. Junior Research Fellows of ICTRC then presented Case Reports of Cancer patients treated in Integrated Cancer Treatment and Research Centre. Dr. Anita Redkar : Ca Cervix, Dr. Yogesh Marathe : Ca Stomach, Dr. Vinita Inje : Ca Breast, Dr. Kisore Karle : Ca Bladder, Dr. Sabir Mujawar : Ca Ovary, Dr. Shweta Gujar then explained Case Record from of ICTRC. Prof. Dr. R.H. Singh Sir delivered valuable & informative lecture on “Rasayan Chikitsa in Cancer”. He also put highlight on “Importance of Samprapti of Cancer from Ayurvedia Perspective”. He explained that Rasayana means not only a nutrition but also a enhancing factor for building immunity. He also explained about Organ Specific Rasayana and age wise Rasayan. Dr. Nimbalkar then gave presentation on protocol designing where he described various aspects of research methodology. Dr. Kishore Karle discussed WHO’s Cancer Control Programme and role of Ayurveda in it. In the next discussion, Dr. Dhananjay Deshpande discussed about Survival Rates of patients of Cervival & Hepatocellular carcinoma treated in Integrated Cancer Treatment and Research Centre. “Integrated Cancer Treatment & Research Centre” of Bharatiya Sanskriti Darshan Trust, Wagholi organized a Free Cancer Check-up Camp at Mangaldham Hall, near Binkhambi Ganesh Mandir , Kolhapur on 26/02/2012 under the guidance of Dr. S. P. Sardeshmukh. Aims of this health camp were check up of cancer patients, awareness about cancer along with their prevention, consultation & guidance. Various types of cancer patients were benefitted through this camp. An Exhibition on “Ayurved for Cancer” was displayed giving information from Basics of cancer to Treatment of Cancer were also held during this event. Dr. S. P. Sardeshmukh & Dr. Arvind Kulkarni delivered a lecture on “Integrated approach of Cancer”. Explaining Integrated approach towards cancer and management of this disease with the help of Ayurveda & Allopathy along with other Pathies such as Ozone therapy, Yoga, Homeopathy etc. Information about early detection, prevention and sign & symptoms of cancers was also given in the lecture. More than 40 Doctors from Kolhapur & nearby area attended the CME. Dr. Kishore Karle Introduced “Integrated Cancer Treatment & Research Centre” to all participants. The Integrated Seminar on CARCINOMA OF LIVER – it’s various aspects & treatment strategies was organized on 2nd December 2011 by Integrated Cancer Treatment & Research Center, Wagholi. During Ist Session, Prof.Dr.S.P.Sardeshmukh, Director of Integrated Cancer Center explained Ayurvedic approach of Carcinoma of Liver & Liver Metastasis in various types. His study was based on observations of 114 patients of liver cancer. He discussed various causative factors responsible for liver cancer according to Dietary pattern, mental stress & Addictions. He also explained practical applications of Ayurved Principles in the management of carcinoma of liver. The II nd session was presented by Prof.Dr.Vineeta Deshmukh Incharge, Integrated Cancer Center. She discussed 3 Cases of liver cancer & liver metastasis which were benefitted in the Integrated Project. She explained that the Reported survival of carcinoma of liver is less than 1 year. But with the help of Ayurvedic treatment, the survival of patients of liver cancer was observed up to 8 yrs & more with no recurrence. Also she had included the treatment analysis & observed results consisting of Clinical & Pathological improvement in the patients included in the Cancer Project of Wagholi. Dr. Abhijeet Kulkarni, Director, Theraputic Endoscopy West Penn Allegheny Health System, Pittsbirgh was the guest speaker for IIIrd session. He presented various aspects of Carcinoma of Liver & it’s treatment strategies. He included the Etio-pathology & advanced treatment modalities available for liver cancer in modern science. The discussion session of patients of liver cancer was arranged with Dr. Abhijit Kulkarni. He explained various advantages & disadvantages of treatments of liver cancer available in the modern science. Also he encouraged patients of liver cancer included in the cancer project with individual thorough discussion. The last session was presented by Dr.Shweta Gujar. She presented the Glimpses of Cancer Project of Integrated Cancer Center, Wagholi. Total 66 delegates including Ayurvedic and Allopathic Physicians from Pune attended the Seminar. Lecturers & Associate Professors of Shalyatantra (Surgery), Shalakyatantra (ENT, Ophthalmology), Kayachikitsa (Medicine), Stree Roga – Prasuti (Gynacology & Obstratics) & Nidan (Pathology) Departments from various Ayurved Colleges in India participated as Trainees. 21 Trainees participated in ‘Reorientation Training Program – I’ while 20 Trainees participated in ‘Reorientation Training Program – II’. Information about Cancer was covered from many aspects like Probable causes of Cancer; Tobacco & Cancer; Signs & symptoms of Cancer; Diagnostic tools of various types of Cancer; Oncopathology; Radiotherapy; Cancer Chemotherapy; ; Cancer Surgery; Ayurvedic approach of Diagnosis of Cancer; Samprapti of Cancer; Various treatment modalities of Cancer from Ayurvedic perspective; Panchakarma Chikitsa; Rasayana Chikitsa in Cancer; Drug standardization of Anti – Cancer medicines; Herbs used in Cancer treatment; Integrated approach in Cancer Management etc. Along with theoretical knowledge, an effort was made to train the trainees to diagnose & treat Cancer patients. For this purpose, Dr. S. P. Sardeshmukh presented Case reports of 15 patients who were treated in Cancer Research Project undertaken by Bharatiya Sanskriti Darshan Trust. Trainees had an opportunity to communicate with these patients directly. This program was appreciated by Trainees as it opened them a new horizon in Cancer Treatment. On the basis of Research work in the field of Cancer, Rashtriya Ayurveda Vidyapeeth (RAV), National Academy of Ayurved, an Autonomous Organisation under Ministry of Health & Family Welfare, Department of AYUSH, Govt. of India, New Delhi; has given an opportunity & sanctioned funds to conduct two Reorientation Training Programs on Significance of Shalyatantra in Cancer to Cancer Research Project directed by Dr. S. P. Sardeshmukh. Aim of Reorientation Training Programs is to update knowledge of teachers in specific subject. This is necessary to enhance their teaching abilities & to upgrade their knowledge. 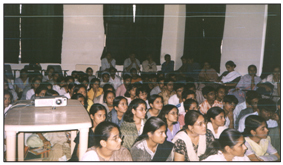 These Reorientation Training Programs were conducted at Ayurved College, Wagholi, Pune from 18/3/2010 to 23/3/2010 under the able guidance of Prof. Dr. S. P. Sardeshmukh. Experts in the field of Cancer from various medical faculties like Chemotherapists, Radiotherapists, Onco – surgeons, Onco – pathologists & Ayurvedic Physicians trained the trainees of Reorientation Training Programs. 18 Oncologists of ‘Reorientation Training Program – I’ & 19 Oncologists of ‘Reorientation Training Program – II’ delivered experience based lectures on Cancer, which were really helpful to train the trainees. In the ancient times, the Gurukul system was the only educational system. To restart the same system of education in the present time, Parampoojya Prabhakaracharya Gurukul has been started at Bharatiya Sanskriti Darshan Trust’s Ayurved College by the inspiration of Prof. Dr. S. P. Sardeshmukh. ‘Gurukul’ means to stay with & learn from the renowned guru i.e. teacher. 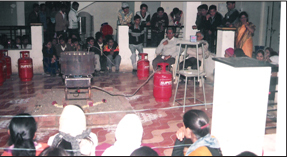 The first session of this Gurukul was conducted between 2nd February, 2010 to 8th February, 2010. 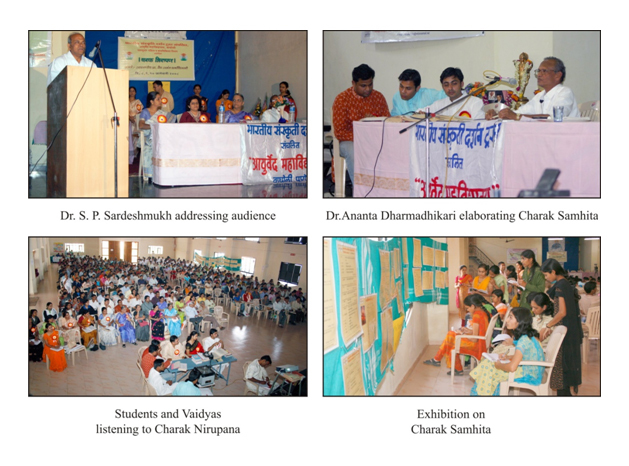 Lectures were delivered on various topics like Bheshajavacharaniya & Chikitsaprabhrutiya; Matrashitiya, Nisneha Vamana; Plants in Pune region; Trividha Dravya Vichara; Prakruti vichar, Triskandha Kosha; Study of Shodhanadi Ganasamgraha; Samanya Vishesha Siddhanta. The daily regime in Gurukul included to get up early in the morning (Brahma Muhurta) followed by Yogabhyasa and consumption of herbal tea & Chyavanprasha. Over 40 students of different Ayurved colleges from Maharashtra state were participated in this Gurukul. The participants expressed their feelings by stating that this Gurukul system of education is not only limited up to the Shastrabhyasa but it helps in developing an ideal personality as a human and Ayurvedic physician. 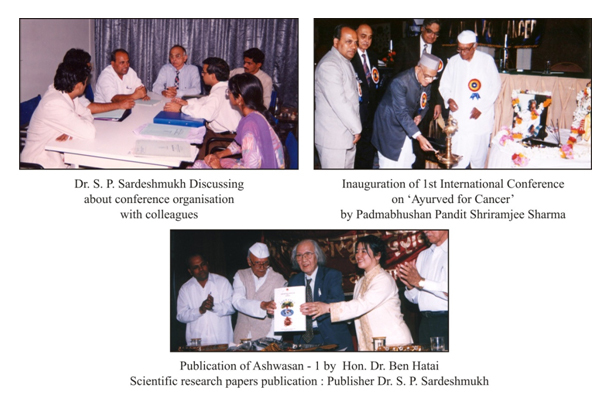 Research publication of scientific papers presented in 3rd International conference on “Ayurved for Cancer” organized by Ayurved Hospital & Research Centre, Wagholi, Pune was published in the form of “Ashwasan III” on 10th February 2008. It was published in the hands of Dr. S. K. Shrivastav, Head of the Department, Radiation Oncology, Tata Memorial Hospital, Mumbai. Publication ceremony was followed by presentation of scientific papers of Cancer Research Project by Research staff. Case presentation of some remarkable cases was also done. Exhibition on “Ayurved & Cancer” was also Arranged on this occasion. With an intention of focusing on the practical utility of Basic principles mentioned in Charak Samhita (An Ancient Indian Ayurvedic text written by Charaka Rishi) and revealing practical utility of these basic principles in Rugna Parikshana (Patient examination) and Chikitsa (Treatment) with relevant examples, Dr. S. P. Sardeshmukh as a Principal – Ayurved Mahavidyalaya (Wagholi) organised a three days seminar entitled ‘Charak Nirupana’ for Post graduate Departments of Kayachikitsa and Sanskrit Samhita Siddhant. Dr. Anant Dharmadhikari (Ex-Dean, Ayurved Faculty, Govt. of Maharashtra and Professor and HOD of Kayachikitsa Dept., Ayurved College, Wagholi). The seminar received an overwhelming response not only from Pune delegates but, from all over the state. Over 550 delegates including practicing vaidyas and students participated in the seminar. Special exhibition was also arranged displaying number of charts elaborating the principles of Charak Samhita. As an effort towards exchange of views between various pathies, Dr. S. P. Sardeshmukh as a Director – Ayurved Hospital and Research Centre organised ‘3rd International Conference on Ayurved for Cancer’ at the ‘Brightland Holiday Village Resorts’ at Mahabaleshwar. The theme of this conference was to highlight the role of Ayurved in overall management of cancer, especially to compliment the radiation therapy and chemotherapy treatments widely practiced at present for cancer control. More than 200 national and international delegate scientists from modern medicine as well as from Ayurvedic disciplines participated the conference and share the experience and thoughts. One more special feature of the conference was the presence of 50 odd cancer patients who made themselves available for live discussions about various types of cancers helping us to try finding best strategies to deal with various situations. It was very stimulating and thought provoking exchange of clinical as well as research experiences for everybody present. Special sessions were allotted for actual cancer patients to express their emotions, difficulties and experiences in dealing with their individual cancer problems. Obviously, this live session turned out to be quite emotional and encouraging to all of the audience. It was very encouraging to see what a patient having positive mental attitude can achieve during his individual fight against cancer. The panel discussion about “Research Directions in Ayurved” turned out to be a great debate amongst the stalwarts working in the field of cancer. Important directions for future research on cancer were churned out after deep insights given by all the panelists. 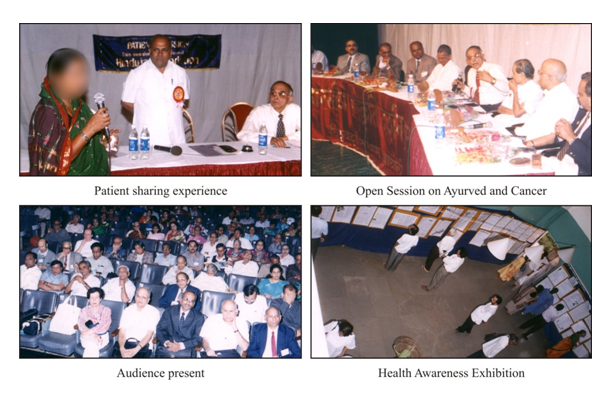 Interactive sessions for Cancer treatment, Exchange of thoughts of various pathies, Presentations of update Scientific records of Ayurved Hospital and Research Centre, Patients interactive session, Display exhibition ‘Ayurved and Cancer’ are few of the highlights of this conference. The conference was appreciated by Indian as well as International delegates from various pathies. The conference proved to be a common platform for sharing the thoughts, experiences and conclusions of Cancer Research in Ayurved and other pathies. The conference gave an optimistic view in the journey of Cancer Research Project. The proceedings of this conference and research papers presented during conference by medical professionals from different pathies were published in form of ‘Ashwasana III’. This book proved to be of immense value to research scientist working in the field of Cancer. Dr. S. P. Sardeshmukh as a Principal – Ayurved College, Wagholi in collaboration with Dhanvantari Pariwar organized Live Surgery Workshop on Shalakya Tantra providing theoretical as well as practical knowledge of Surgery aspect of Ayurved. The workshop was conducted in two sessions – Live surgical session and Guest lecture session. It proved to be great informative and guiding to all the 254 participants due to live transmission and live commentary. Dr. S. P. Sardeshmukh as a Principal – Ayurved College, Wagholi, arranged Aushadhi Nirman Karyashala with the collaboration of Dhanvantari Pariwar on Traditional Methods of Preparation of Ayurvedic Medicines. 350 Students from various colleges all over Maharashtra and Goa participated in this workshop. Experts from field of Rasashastra guided students. Practicals of various medicinal preparations like Kashayakalpana, Avaleha, Kupi Pakva Rasayana and Rasaushadhi were performed. Preparations of Bhasma, Puta etc. were also performed. Students were also given opportunity to prepare the medicines themselves in front of and under the guidance of experts. Indeed this workshop proved to be a great success. Vaidyaraj Bindumadhav Katti was well known in the field of Ayurved for his contribution in the field of Ayurvedic Treatment (Chikitsa). After his heavenly abode as a tribute to him every year Dr. S. P. Sardeshmukh organises an informative event on his Punyatithi, in the form of lecture by eminent Ayurvedic Physician who have been a student of Guruvarya Vaidyaraj Bindumadhav Katti. Three events are arranged as Lecture session, Essay competition and Prize distribution for excellence in the subject Medicine (Kayachikitsa). Four week duration programme regarding theory and practical of Authentic Panchakarma by eminent Panchakarma Specialist was arranged by Dr. S. P. Sardeshmukh in Ayurved College, Wagholi. It was approved by I. S. M. H. and graced by experts in the field all over Maharashtra. The course was organized for lecturers and professionals in the Panchakarma field from Maharashtra. It was appreciated and proved to be of great benefit for the attended trainees. The trainees were given a comprehended book on the lecture series that took place. After encouraging feedback about the first conference, second conference was held by Dr. S. P. Sardeshmukh as Director – Ayurved Hospital and Research Centre at Balgandharva Rangamandir – Pune. It fetched various professionals from Oriental and Western world on one platform. It proved to be a positive step in the journey of Cancer Research Project. This conference was conducted by Dr. S. P. Sardeshmukh as a Director – Ayurved Hospital and Research Centre at Hotel Holiday Inn at Pune. The conference was aimed at discussing the contribution of ‘Ayurved for Cancer’ and to discuss the treatments offered world over. About 200 national and international experts from Modern Medicines, Ayurved, Homeopathy, Reki, Naturopathy etc. attended this conference. Successful interaction about Cancer and Research about it was made possible to national and international practitioners during this conference. Liver is a vital part of body. It is most important organ in digestion and formation of blood. The lifestyle in today’s world is resulting in various liver disorders. In this seminar anatomy and physiology of Liver, Causes – Signs and Symptoms of various Liver disorders along with their treatments were explained by Ayurvedic experts as well as Allopathic experts to the participants. Dr. S. P. Sardeshmukh as a Director – Ayurved Hospital and Research Centre, organised a Panchakarma Seminar at Wagholi, wherein lectures were delivered by eminent Panchakarma Specialist, which gave many guidelines to the Panchakarma Practitioners and Students who attended the program. A booklet containing ready references for Panchakarma from Ayurvedic texts like Sushruta, Charaka, Vagbhata and Bhavaprakasha (Editor : Dr. S. P. Sardeshmukh) was also published on this occasion. Rejuvenation and Aphrodisiac are two important branches among Eight branches of Ayurved. Rejuvenation is essential to enhance the immunity for prevention of diseases and also for curing the disease. Aphrodisiac is vital for physically, psychologically and mentally healthy progeny. With an intention of impart authentic knowledge of these two branches, this seminar was organized. The efficacy of Ayurvedic Medicine like Vati, Siddha Taila, Siddha Ghrita, Avaleha, Rasakalpa is enhanced, if they are prepared following the exact methods mentioned in ancient Ayurvedic Texts. This seminar was specifically organised to give knowledge about the traditional methods of preparation of Ayurvedic Medicines. Validity of Ayurvedic Results is more effectively assessed if it is done using modern parameters. Thus, the seminar was organised for Ayurvedic Researchers to guide and discuss the methodology of Modern Science which can be applied in Ayurvedic Research. Research is an essential part of any science. It’s a need of time to re-identify the Ayurvedic principals from ancient text in today’s era. This seminar was specifically organised to give the guidelines about systematic methods applying which any research should be done and the approach one should keep while studying from research point of view.